There is a homecoming on tap for the New York Islanders, as they will soon play their first regular-season game at Nassau Coliseum in more than three years. Their return to the venue is effectively a stopgap until a new Belmont Park arena opens, but it should prompt plenty of fond memories while building anticipation for the future. On December 1, the Islanders will face the Columbus Blue Jackets in their first regular-season game at the Coliseum since the 2014-15 season. With that date approaching, it is worth looking back at the Islanders’ original run at the Coliseum, and how the recently renovated venue will factor into the team’s plans for upcoming seasons. In 1972, the NHL expanded to 16 teams with the addition of the Islanders and the Atlanta Flames (now Calgary Flames). The Islanders marked the second club in the New York metropolitan area, following the New York Rangers, and moved into the new Nassau Coliseum—effectively allowing the NHL to prevent a World Hockey Association club from setting up shop in the venue. The Islanders played there during what could be considered their glory years, including a run of four-consecutive Stanley Cups from 1980-1983. The franchise remained there for years beyond its dynasty period but spent considerable time along the way seeking a new or renovated arena. One of the last proposals before the team’s departure from the Coliseum was put before voters in 2011, with a $400-million bond referendum to include a new $350-million Islanders arena and a $50-million minor-league ballpark. Voters overwhelmingly rejected that plan, however, which came after other failed attempts to secure a long-term home for the Islanders—including a pitch for a renovated Coliseum surrounded by new mixed-use development. After their Coliseum lease expired following the 2014-15 season, the Islanders moved to Brooklyn’s Barclays Center. A state-of-the-art venue that opened in 2012, the Barclays Center was originally designed and constructed for the NBA’s Nets and proved to not be a suitable venue for hockey. Fans complained of poor sightlines while players criticized its ice surface. On top of that, the proximity from Long Island proved to be too much for the team’s original fan base, and its attendance numbers in Brooklyn were generally among the lowest in the league. As the Islanders played out their initial years at the Barclays Center, the Coliseum underwent a renovation. 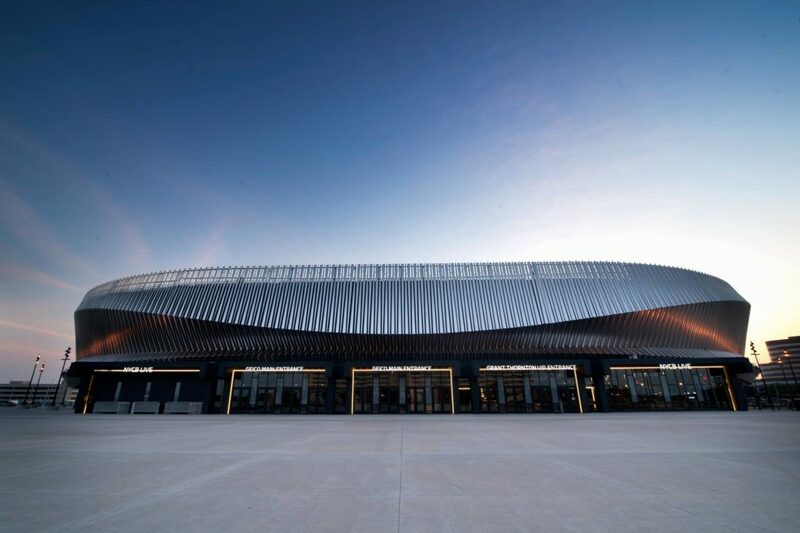 Upon reopening in 2017, the venue featured a reduced seating capacity along with a new name as the result of a naming-rights deal—NYCB Live, home of the Nassau Veterans Memorial Coliseum. The renovated Coliseum was not viewed as a permanent home option for the Islanders, who were searching for a new arena as a result of their dissatisfaction with Barclays Center, but received support from fans and elected officials as a potential temporary venue until a new facility was constructed. In December of last year, the Islanders’ search for a new arena gathered new momentum, as a bid to construct a new venue and surrounding development on land at Belmont Park was accepted. Work is currently taking place on an environmental impact report for that project, with the Islanders anticipating that construction could begin in May and the arena open in time for the 2021-22 season. Between now and when the new arena opens, the Islanders will play portions of their home schedule at the Coliseum and the Barclays Center. The team initially scheduled 20 games at the Coliseum for this season, but recently announced that a February 28 game will be moved there as well. The Islanders will be largely focused on the development of their new arena over the coming years but playing home games at the Coliseum should provide a few advantages from a fan outreach perspective. Aside from providing bursts of nostalgia over the team’s original run at the Coliseum, it should also build anticipation among the team’s Long Island fan base for the upcoming Belmont Park arena. When the Belmont Park arena opens, it will mark a new era for the Islanders, but for now the team can build anticipation for its future by tapping into its past.